She wasn't in a bridal party, like the people sitting next to me hypothesized. 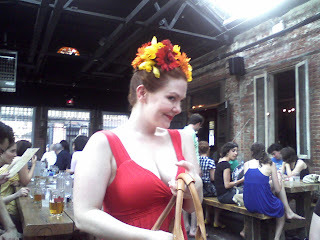 My stylish, talented pal Jen here celebrated her bday at the Brooklyn Beer Garden. This party was a test of my love for the hubs. 1. I don't like traveling to Brooklyn. 2. I've got the best damn beer garden in walking distance from me. The Brooklyn Beer Garden attempts to act like it's got history in this neighborhood that has been completely overhauled to be hipster-friendly. It was not a neighborhood of Czechs like Astoria, it was mostly Jewish and Latino. The Brooklyn Beer Garden's "out door" section has an open roof, but the windows are nailed shut. There are also no fans. I guess this is what makes it "old timey", because it's similar to a sweat shop on a 90 degree day. I'd complain, but no one has more need to complain than the sausage dude that was working on fryer all day. I really can't complain either, because the company and delicious beers made the time spent there well worth it. I rolled in with fellow Astorian, Rachel, around 6pm, and ended up chatting it up with party goers until 12:30am, when a newly made pal walked me to the cab station. -a view finder with interesting animals, that I'm pretty sure aren't real. Conclusion: J-Hubs's birthday brings out the bubbly animal in all of us, and she's the flowery centerpiece of festivities. The Beer Garden in Astoria RULES!!! !